Individuals often find themselves requiring a forklift truck license. This is often for one of two reasons, either to be eligible for a new job or alternatively in order to further an individual’s career and gain access to the next rung on the job ladder. The first step in acquiring a forklift truck license is to find a training centre locally. 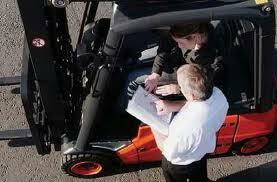 In most cases a forklift truck training course typically lasts between 5 and 10 days. The duration of the course depends largely on the number of people in the class and the previous experience and ability of the individual. Forklift truck training courses can often be easily completed by individuals regardless of their previous experience, or lack of it. This is because forklift truck training courses often operate on a number of levels ranging from beginner to advanced ability. During the course, individuals will be instructed in how to safely start, manoeuvre and drive a forklift truck. Once an individual has finished practising driving a forklift truck and learning the associated safety regulations, they are required to sit two examinations. One of the examinations is a written test, whilst the second examination is a practical test. The procedure is extremely similar to the one required to obtain a driving license. During the practical aspect of the examination individuals have to prove that they are competent in performing equipment inspections, are able to safely manoeuvre the forklift truck in tight and restricted areas with and without loads and are able to load and unload the forklift truck to various heights. In order to pass the practical aspect of the examination an individual needs to successfully obtain at least 25 points. Once an individual passes both aspects of the examination, they will be rewarded with a Certificate of Basic Training. This certificate means that the individual in question is fully qualified to drive a forklift truck, enabling them to then apply for the desired job or gain the prestigious promotion. Prior to booking a forklift truck training course it is essential to select a centre or institution which has the correct credentials and operates legitimately. Failure to do this could result in a forklift truck license or qualification which is invalid. Legitimate and recognised centres can be easily recognised by the RTITB logo and the ITSSAR logo, which should appear on the company’s website, course outline and associated literature. This entry was posted in Health & Safety and tagged forklift truck license on December 13, 2013 by admin.